One of the most stunning regions of the Large Magellanic Cloud (LMC), a galactic companion of the Milky Way, is the Tarantula Nebula. 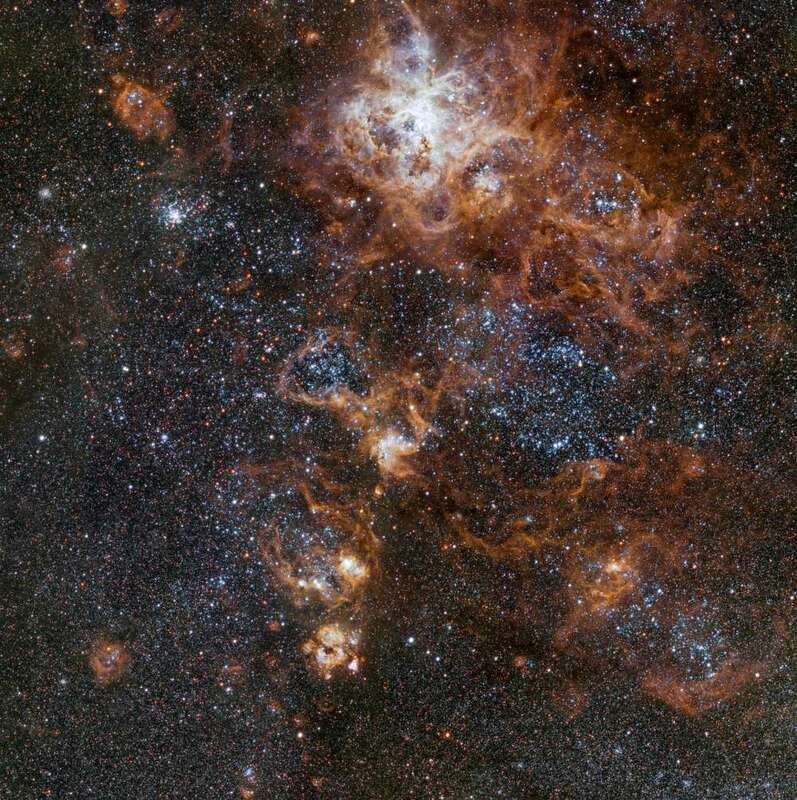 The structure stretches for over 1,000 light-years, about 9 percent of the whole LMC. The VLT Survey Telescope (VST) has now snapped the sharpest ever image of this whole field. The new and very detailed set of observations shows the complex environment of the nebula and its neighbors. Star clusters, glowing gas clouds, and the remnant of ancestral supernova explosions make up this cosmic object, which was first recorded by French astronomer Nicolas-Louis de Lacaille in 1751. The Tarantula Nebula is not just beautiful. It is a region of records. At its center, we find the most energetic region in the local group of galaxies for star-formation and it is also the brightest. One of its star clusters, NGC 2070, contains starburst region R136, which is where we have found some of the most massive and most luminous stars ever observed. Another star cluster in the Tarantula Nebula is Hodge 301, and its claim to fame is not about the stars that were born there but stars that died. About 40 supernovae are estimated to have blown up in the area, spreading their gaseous tendrils across the region. Some of this gas is already making new stars, like in the case of the NGC 2060 star cluster. The core might seem to be getting all the glory but the whole nebula has huge astronomical importance. And even its outskirts have become part of astronomical history. Supernova 1987A exploded at the edge of the Tarantula Nebula and remains the closest supernova to Earth in about 400 years, since Kepler’s supernova was seen exploding in 1604. A 3D video reconstruction of the 1987A supernova can be seen here. These latest images and the video of the nebula were possible thanks to the extraordinary capabilities of European Southern Observatory instruments. The VST is equipped with an incredible 256-megapixel camera and has four different color filters, one of which is specially designed to capture the brightness of hydrogen gas, making it an ideal instrument to capture views of nebulae in all their glory. And this is one glorious nebula.